You can tell the difference between a Stuart M3A3 and a M5 by looking at the engine hatch covers. 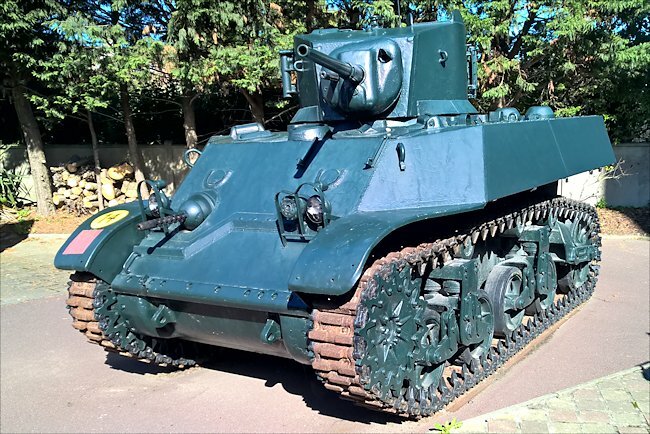 In this M3A3 tank at Ouistreham Le Grand Bunker Museum they are flat and in line with the rest of the chassis top. The engine hatch cover on the back of the M5 Stuart are raised. 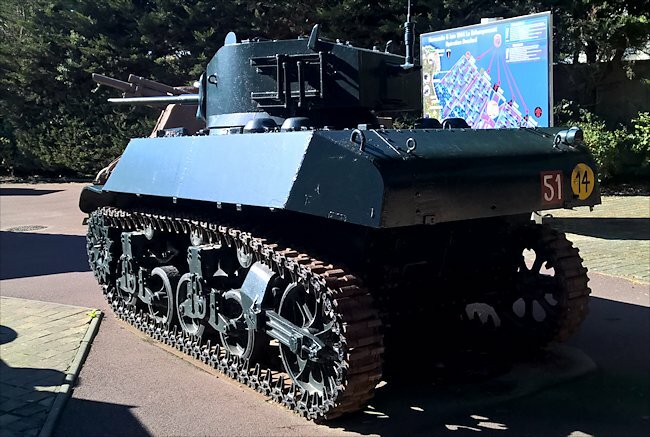 The Musee Le Grand Bunker Museum in Ouistreham is set in the middle of an attractive tree lined residential area about 500m south of the coast. It is at the junction of the Avenue du 6 Juin with the Avenue de la Plage. When entering the address into your Sat-Nav device use the Avenue de la Plage road name. I have found a problem with entering the number 6 in the Avenue du 6 Juin road name on different devices a problem: some want the number 6 and others want the letters six. Surprisingly this small tank had a four man crew: a commander, gunner, driver and co-driver/machine gunner. It was very cramped. It was powered by a Continental W-670-9A seven cylinder air cooled radial engine that produced 250 bhp. It gave the Stuart a maximum road speed of 36 mph (58 km/h) and off road it could go at 18 mph (29 km/h). It did not have room for large fuel tanks so it only had an operational range of about 74 miles (119 km) before it needed to be refueled. 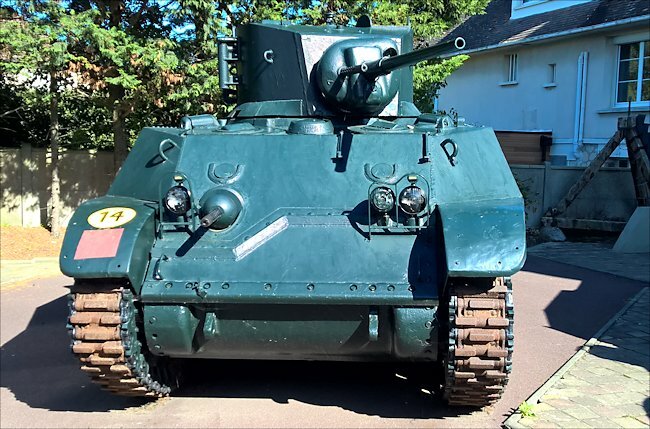 The M3A3 Stuart Light tank was armed with a 37mm M6 gun in a M44 mount. The tank could carry 174 rounds. In 1944 this gun could not penetrate the frontal armour of any of Germany's main battle tanks or tank destroyers. It was meant to be used as a reconnaissance scout vehicle. It was also issued with three .30-06 Browning M1919A4 machine guns. One in a ball mount in the hull, another next to the main gun in the turret and a third could be attached to the roof of the turret. The Stuart could deal with encounters with enemy infantry, half-tracks, and artillery positions. 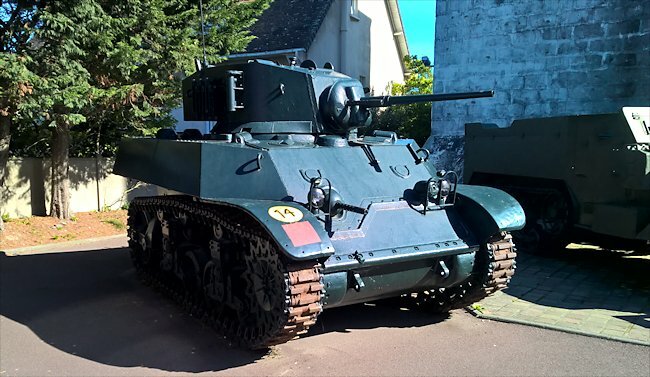 The Stuart tank had armour thickness that ranged from only 13mm to 51 mm at the front. It had good sloping armour at the front which helped improve protection but it could not withstand a direct hit from a Panther tank's high velocity 75 mm gun or a Tiger tanks 88 mm gun. Stuart light tanks were built in various different versions between 1941 and 1944. Around 25,000 were produced. They served in the deserts of North Africa, the mountain regions of Italy, the hedgerow bocage country of Normandy to the jungles of the Pacific. They were meant to be fast and nimble not hard hitting heavy tanks. The Stuart tank was armed with a 37mm main gun and a machine gun in the hull and turret.